Please note that we will be closed from June 21st 2018 to July 8th 2018 and will be unable to ship any orders during this time. Sorry for the inconvenience. NEW! Now available... The RSG-4 from Scada Research with the automatic zapper sequence mode (as recommended by Dr. Hulda Clark), multiple frequencies at 728Hz, 2128Hz , 30kHz and a sweep frequency function from 500kHz to 100Hz and is based on research by Dr. Hulda Clark. It also features a sleek design with electronics and battery built into the handholds making this unit easily portable. Handholds are also made of stainless steel for long lasting durability. All this is now for the low discount price of US$149. The RSG-4 is on sale at only US$149. You save $20! Automated pre-programmed zapper sequence as recommended by Dr. Hulda Clark at frequency of 30kHz. Continuous modes also available at ~0.7kHz, ~2kHz and 30kHz. Sweep function continuous mode at the range of 500kHz to 0.1kHz. 2 LEDs to indicate mode or frequency selection and low battery indication. Stainless steel handholds for long lasting durability. Sleek built-in electronics and battery compartment design for ultra portability. Also available... The RSG-2 from Scada Research with multiple frequencies of 4Hz, 16Hz and 100Hz is an improved and more advanced Beck pulser. The RSG-2 is also a colloidal silver generator with a 1mA constant current (for small silver particles of constant size) and 20mA current limit (based on Dr. Beck's original design of the colloidal silver generator). All this for the low price of $199. On Sale for only US$199. You save $20! PULSER mode - Frequencies of 4Hz, 16Hz and 100Hz. PULSER mode - Status LED indicating 30VDC biphasic pulses and battery power. Colloidal Silver direct current generation with 1mA constant current. Colloidal Silver direct current generation with 20mA current limit. SILVER mode - Status LED indicating current conductivity/colloidal silver generation. 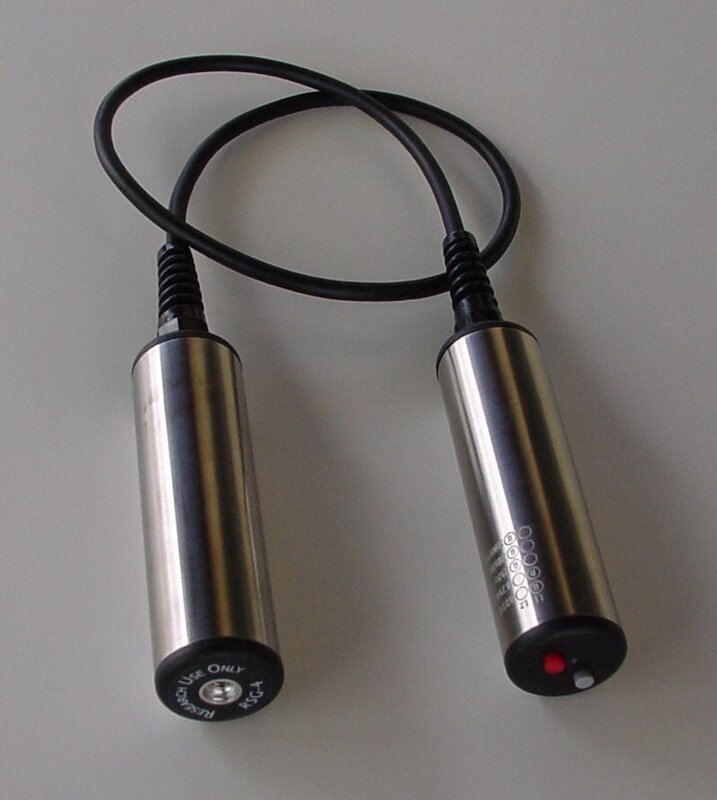 Includes accessories for use as a Bob Beck Pulser and Colloidal Silver Generator. Also available... The RSG-1 from Scada Research combines the best features of the Bob Beck pulser, Hulda Clark zapper and a colloidal silver generator. The RSG-1 is an improved Beck pulser with multiple frequencies of 4Hz, 16Hz and 100Hz, all with built-in timers. It is also an advanced Clark zapper with the pre-programmed zapper sequence as recommended by Dr. Hulda Clark for multiple frequencies of 2128Hz, 10kHz and 30kHz for beginners and continuous mode for the advanced user. The RSG-1 is also a great experimental device for people interested in making colloidal silver as the unit comes with direct current method, alternating current methods, automatic polarity swap for direct current method etc. All currently for the discounted price of $269. Now on sale for only US$269 You save $20! PULSER modes - Frequencies of 4Hz, 16Hz and 100Hz with built-in digital timers. Push button to set the timer and unit beeps when timing has stopped. ZAPPER modes - Frequencies of 2128Hz, 10kHz and 30kHz with pre-programmed zapper sequence as recommended by Dr. Hulda Clark and continuous zapping for the more experienced user. SILVER mode - Colloidal Silver Direct and Alternating Current Generation with Built-in digital timers and much more . Includes accessories for use as the Bob Beck Pulser, Hulda Clark Zapper and Colloidal Silver Generator. Disclaimer: These devices are for experimental use only and are not intended as medical devices.